Keeping track with the latest market development we are actively engaged in offering supreme quality of Pillow Protector . Our Superior quilted pillow protectors provide allegy protection. These easy care protectors are machine washable, comfortable and hygenic, providing comfort all year round. These are highly breathable and helpful in keeping away asthma and allergies and dust mites and bed bugs as well. Also, these protectors are known for water, wear & tear and stain resistance. Prolong the life of your pillow with our Pillow Protector range which adds a layer of protection from marks and stains. This is the single best way to enhance the life of Pillows. Please order for our Pillow Protectors. 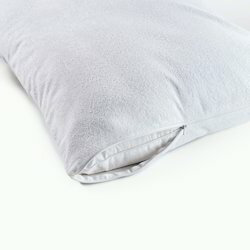 We are the leading manufacturers and suppliers of a wide range of Disposable Cotton Pillow Protectors. These protectors are hygienic and placed on the pillow while giving massage and facial treatment, so that the pillow does not get spoiled. 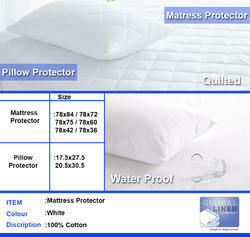 Leveraging on our enriched industry experience, we are engaged in offering a huge gamut of Pillow Protector. These are highly breathable and helpful in keeping away asthma and allergies and dust mites and bed bugs as well. Also, these protectors are known for water, wear & tear and stain resistance. Thus, these are widely appreciated in the market segments. White Cotton Quilted Pillow Protector, Size: 20"x30"
Application: Home, Hospital, Hotel etc.